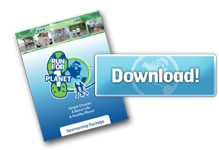 For Sponsorship Opportunities, Please Contact: Greg Ceci, Sponsorship Director, GCeci@RunForOnePlanet.com. Click download to the right to download our sponsorship package. The below eco-businesses are the first to believe in the dream of the Run for One Planet, before the vision became reality. We want to thank them very much for supporting us right from our humble beginnings.